The Homeless Outreach and Proactive Enforcement (H.O.P.E.) program is a pro-active approach intended to ultimately reduce calls for service and other resources currently required to deal with the homeless population. A community policing philosophy will be used to link the homeless population with resources and service providers throughout the county. The objective is to stop the revolving door of arrest, incarceration,and then release regarding homeless related crimes. Currently, the H.O.P.E. team is a four man team assigned throughout the County. Personnel assigned to the H.O.P.E. team will each be responsible for a region of the county to connect with resources, service providers, and points of contact for each station. The H.O.P.E. program aims to balance pro-active outreach with enforcement of the law, while connecting members of the homeless population with resources that may help them transition from homelessness. The ultimate goal is to reduce the rate of recidivism and reduce the current costs associated to homeless related crime. The vision of H.O.P.E. 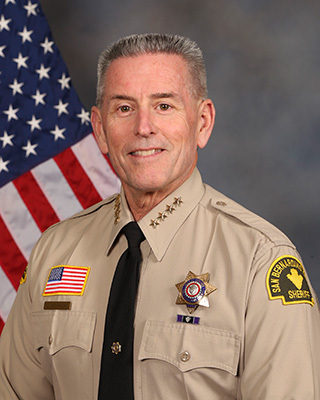 is to increase the quality of life for all citizens of San Bernardino County by reducing crime associated with the homeless population and subsequently saving taxpayer costs and resources. Each station commander will assign one deputy as a Community Resource Officer (CRO). The CRO will assist in relaying information and the specific needs from their region to the H.O.P.E. team. The H.O.P.E. team will assist each station by helping deputies to connect with needed resources, as well as providing resource information that can be given to the homeless upon contact. Through this collaborative effort, the department and county can achieve long-term cost and resource savings. We all want to help; the question is “How can I give in a way that will truly help?” Know before you give. Support solutions, not panhandling. The Homeless Outreach and Proactive Enforcement encourages you to make your donations count by giving to organizations that assist homeless persons. Statistics show that most panhandlers are not homeless and those who are homeless do not panhandle.